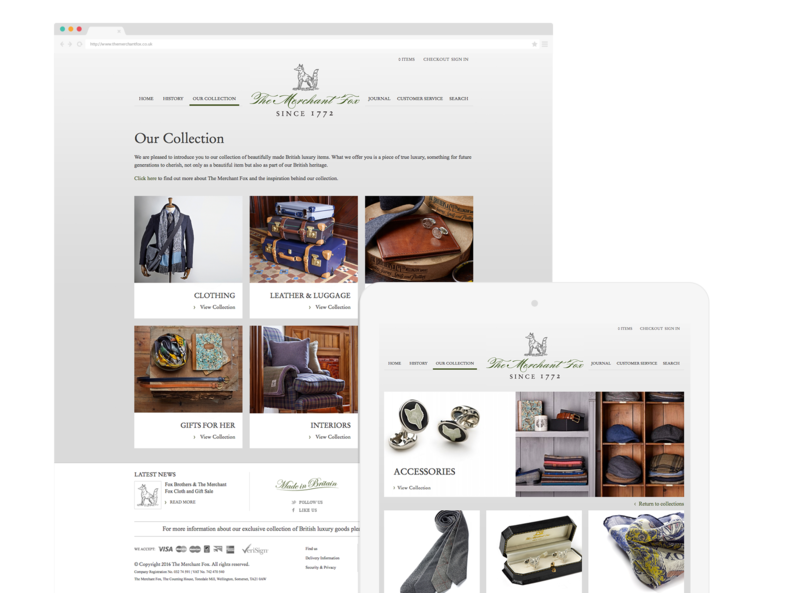 The Merchant Fox required a new eCommerce website to showcase their new luxury goods. It was clear from the start, this was a very unique product range, which required a site to reflect this. Our brief was to design a website that was true to that, to identity and encompass the high quality nature of the products sold on the website. Evosite created a website to reflect the quality and heritage of the brand and the collections. Fine and exquisite detail is a feature of so many of the featured products, so simple and highly effective zooming operates for all product views. It’s a close as you can get to holding the products in your hand. We worked closely with our client to create a look and feel that appealed to their customers, reflected the prestige of the brand, and which displayed the products tastefully and effectively. The flexibility of the Evosite platform meant that the values of this prestigious brand could be brought to digital media without compromise. Understated elegance characterises the choice of colours, typography and layouts. The design work blends into the background and the navigation is highly graphical to ensure that the exclusive product ranges remain the focus of attention.